Resonances of this moment in time are reflected with in-your-face persistence by Joshua Harmon's new play, Admissions at Lincoln Center’s Mitzi Newhouse Theatre. In the past two years, the blatant appearances have been evident - suspicion, even hatred of "the other," those of different races, religions and countries. Diversity has pulled us apart, friends, family against relatives, the haves versus have-nots, liberals and conservatives at frightening new levels of separation. While Harmon (Bad Jews) wrote Admissions before the last presidential election, he places these elements in the context of college admissions. Daniel Aukin directs the play with brisk agility, evoking emotions of fury and humor, driving viewers toward the edge of their seats to catch the sentiments that propel the play, often with passionate loud rants. A family is almost torn apart by issues of Charlie Luther Mason's acceptance into the right school, guaranteeing the attainment of future success, and we're talking about a family with everything going for it. Lincoln Center presented a different view of the same situation earlier this season in Pipeline by Dominique Morriseau. 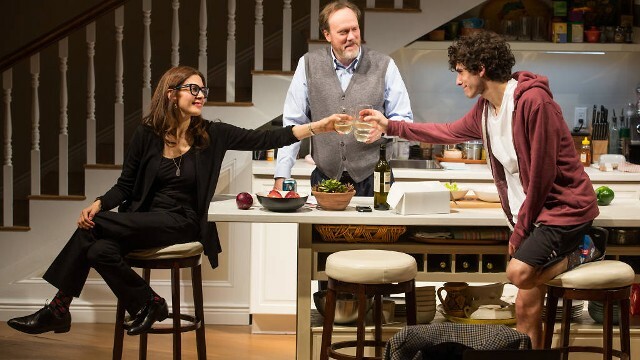 On stage throughout, Charlie's mother, a resolute Sherri Rosen-Mason, played by Jessica Hecht, is Head of Admissions of Hillcrest, one of the better, if not top prep schools. His father, Bill (Andrew Garman), is Head of the school. They have long devoted themselves to bringing diversity to the school and always assumed that their son, Charlie (Ben Edelman), would be accepted into Yale, the school he dreamed of attending, or so his mother claims. Charlie planned to go to Yale with his best friend, Perry (never shown) and when Perry is accepted and Charlie is put on the wait list, he loses it. In a charged tirade, he blames the world, Perry for being bi-racial, the school for only making Charlie an editor while a Hispanic girl (less qualified, he claims) is editor-in-chief. Inflamed, he blames Latin Americans for considering themselves people in color to get minority rights. Charlie rages on that he has done everything right but because he is white...well, you get it. Also frustrated, Sherri is determined to call Yale and finagle a place for her son. No other school will do. Sherri is humiliated when Ginny, her best friend and Perry's mother, offers to use her connections to help Charlie get into another good school, albeit not as prestigious as Yale. Sherri later alienates Ginny, played by a high-spirited Sally Murphy, claiming that Perry was accepted at Yale because his father is black, never recognizing how he may have been held back just for that reason. Several months later, Charlie has calmed down. He decides that his parents are right about diversity and goes even further, claiming he has the right to make his own plans for the future. He writes an editorial that he is rescinding all his college applications and now plans to go to a community college. He offers his parents' college fund as a scholarship to help a worthwhile minority student. Not surprisingly, all this does not go down well with Charlie's stunned parents. Joshua Harmon is on target showing the family strains from both sides. What is lacking, however, is the black in this all-white cast which is discussing race and education. If we had seen Perry and his black father on stage, it would have added an extended layer of realism. Consider that the play begins with Sherri's meeting with Roberta from the school's development department. Sherri is demanding more black faces be added to the catalogue. The always able Ann McDonough, playing the overtaxed Roberta, points out variations of racial colors while Sherri demands that black look like black. As Bill, Garman does not hold back his anger toward his son's behavior, outraged with Charlie self-involvement and immaturity. Ben Edelman persuasively communicates Charlie's complicated adolescence, mingling aggressive growth toward adulthood with remnants of childishness. In Charlie's articulate if overwrought rants, Edelman voices the clearest hypocrisy of white views on racism. Hecht is convincing in her role as Sherri. Often her theater performances are more mannered. Her turnabout after her son's second diatribe is especially persuasive, watching the family disintegrate and then demanding that Charlie accept his admission to another school. When he questions why, she fires back, purely from the gut, "Because you're my son! You are my son!" We sense the family will not fully recover. With subtle lighting by Mark Barton, Riccardo Hernandez's set shares space as the family home and Sherri's office, with a table/desk and a long staircase behind the kitchen where Charlie alternately stomps, races or lumbers up. In the semi-round space, a sofa sits facing the playing space with its back to the center audience. Toni-Leslie James dresses the reed-slim Jessica Hecht in black with jackets for home and work. Director Aukin moves the turmoil with fluidity. The principles, broadly stated, are the heart of this play, inspiring and driving the flawed characters. Like Pipeline, from a different sphere, Admissions has a message to give and states it emphatically.